Aixro Engines Flow fresh gases through the first port enter the engine from one side plate. Then they flow through the rotor and the eccentric shaft in axial direction to cool and lubricate the rotor, eccentric shaft and main bearing, and from there they enter the combustion chamber through a transfer port in the opposite side plate. The second inlet allows additional air flow directly into the combustion chamber to provide additional power when needed. Though Aixro Engines are operated with carburettors and fuel lubrication, they achieve very good exhaust emissions. According to our customers the fuel consumption is approximately 20% lower than 2-stroke engines’ of similar power. Aixro engines achieve enormous operation performance and have long service intervals. Using a rotary engine is simple. But making it requires highest precision, state of the art technology and technical expertise. It is not without cause that so many Wankel projects in the automotive industry failed despite enormous resources. With our partner and license holder of our designs, aixro GmbH of Josef Rothkrantz, we have proved how good the Wankel principle is. But this impression is not enough. 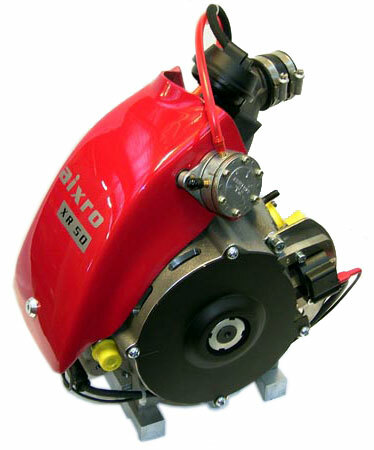 Therefore Aixro GmbH continually improves the engines and produces all aixro engines to highest quality standards. In addition every engine is tested on the in-house dynamometer before delivery. It is only with a perfect product that we can ensure our good reputation for the future and give our customers the confidence they need for a complex technology like the Wankel engine. Aixro’s CNC Technology assists with rotary engine production on a very high level. AIXRO use ultramodern CNC machines because they enable them to manufacture micron-precise level. In the manu=facturing process, a strict compliance with all measures and the precision with which even the most complicated parts are manufactured ensure a consistently good quality and improved sturdiness of our engines. Integrating CNC production into our procedure means that everything from production to manufacturing to assemblage is a one-stop process – without any loss of quality. Each single part undergoes a final quality inspection, checked by our 3D-measuring equipment. At the end all assembled engines are tested for function and performance. Our test rig assists us in ensuring reliability and durability of every single one of our engines.